The Yuppie Puppy Anti-Pull Harness is a back clip harness designed to discourage pulling. It is an aversive training device that makes pulling uncomfortable. 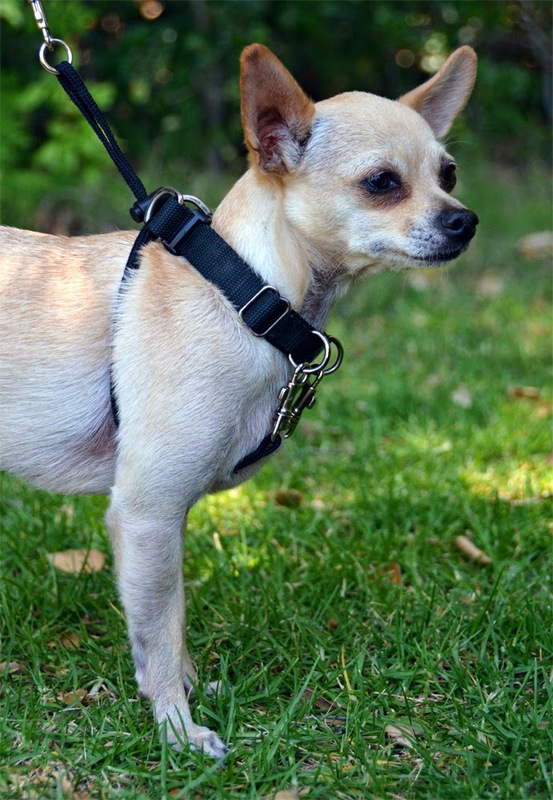 The harness is available in four colors and four sizes to fit dogs with necks 3-33" around. Not every size is available in every color. I call this style of no-pull band-aid a "string harness". Wide, flat harness straps distribute force and make pulling more comfortable, so pulling harnesses and roading collars are made from wide strapping. This harness works on the same principle, a narrow and rounded cord is the least comfortable thing to pull against because it concentrates the force. 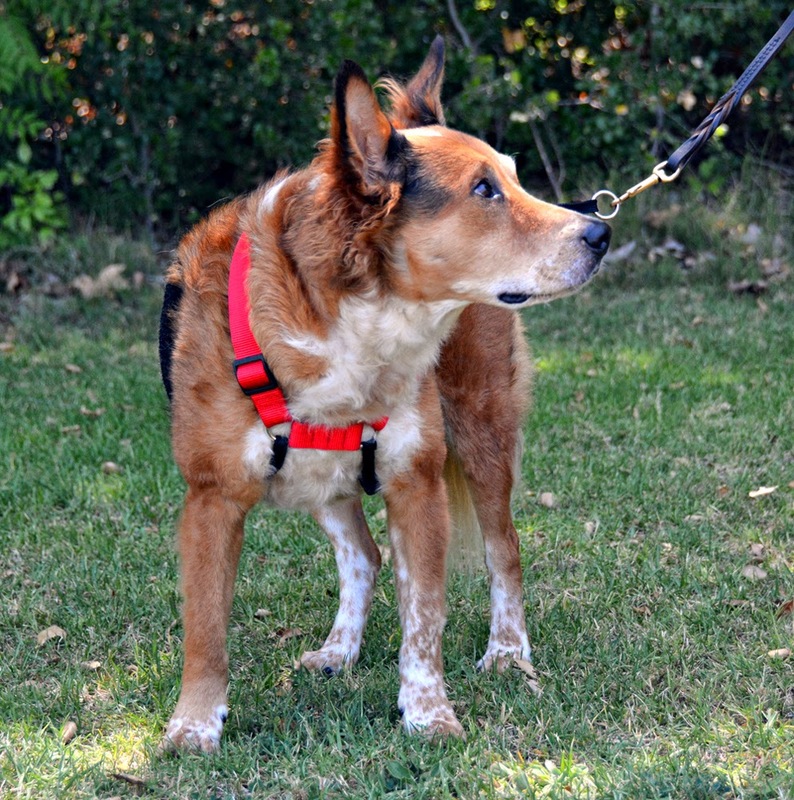 Of course, pulling on a rounded choke collar isn't aversive enough to discourage an insensitive dog from pulling, so string harnesses route those cords across more sensitive areas like the underarms. So how does it work? The Yuppie Puppy Anti-Pull harness consists of a nylon strap collar or chest strap, and a pair of rounded cords that attach to the front of the collar, run under the dog's front legs, and then come up behind the front legs. The cords run through a ring in the back of the collar and then attach to a leash ring. 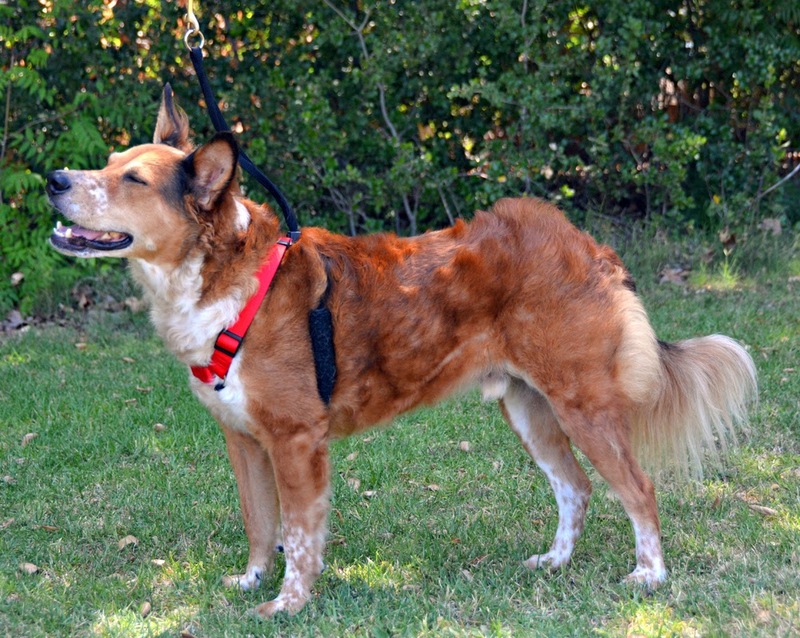 When leash pressure is applied, the cords pull through the ring and tighten across the dog's armpits. A plastic toggle adjusts how loose the cords can fall when slack. Ideally there should not be a lot of slack, the dog should feel the cords tighten when any leash pressure is applied. If the cords are too loose, the dog can build up a bit of speed before the cords tighten, making the correction more harsh. Older style string harness, photo by Erin Koski. When these harnesses first came out in the early 1990's, they consisted of an adjustable collar and cords that could be unclipped and removed altogether. The harness on Ru is by Four Paws, but is identical to the Sporn harness I used on Sid the weimeraner down the street when I was a kid. The idea was that the collar portion could be used as an actual collar, and the leash could be attached to both the pull cords and the collar as a way of transitioning from the harness to walking on a normal collar. The Yuppie Puppy harness seems to have abandoned this concept, I like to think it's a simpler design for simpler people. Still, it works. The red and black Yuppie Puppy harness on Brisbane is a little out of date, the current model is the Mesh Anti-Pull harness, but the concept remains unchanged. I consider string harnesses to be more aversive than the Premier Easy Walk harness, but less aversive than prong collars and choke chains. It's a great way to get the attention of large and insensitive dogs, and can allow a relatively small person to control a very large dog. I think Sid and I were the same height at the shoulder. There was a particularly wild Labradoodle in Ru's puppy obedience class that did not seem capable of learning to chill out and stop jumping on people until the trainer put a Yuppie Puppy Anti-Pull harness on her. Kirby never came back to obedience class after the harness apparently solved all of her behavioral problems. Pros: Works well for control of large dogs, and helps insensitive dogs learn when they are actually pulling on leash. I would recommend this for people who are small, fragile, or recovering from an injury where they can't handle any leash pulling at all. The fleece sleeves on the Yuppie Puppy harness also make it more comfortable and less aversive. Cons: While not terribly aversive, this harness still works by making pulling hurt. I would not use it on a sensitive or reactive dog, and I would be watching my dog to see if any of their manners worsened on leash. A lot of people seem to forget or not realize how this harness works, I see dogs running in them at the off leash beach, and I cringe every time I see someone try to encourage their dog to jump into the car by pulling up on a leash that is attached to one of these. It's also more complicated that a lot of other no-pull solutions, and that makes it less useful for people who get confused by masses of cords and straps. Bottom Line: Good for stubborn, insensitive dogs, and dogs that don't even realize they are pulling. Works as a decent band-aid for pulling and I think it is less likely to cause behavior problems than a prong collar.